Back in 2008, Chinese entrepreneur Zhou Jian did not know much about robots. At a technology fair in Japan that year, he saw Honda’s ASIMO for the first time. Born in 2000 at 1.3 m (4 ft 3″) tall weighing 54 kg (119 lb), ASIMO is one of the world’s most recognizable humanoid robots. The name ASIMO stands for “Advanced Step in Innovative Mobility” with the aim to help people in various situations of need, such as the elderly and disaster response. Captivated, Zhou imagined a world in which humanoid robots were commonplace; they could be helpers, companions, educators, or entertainers. At the time, however, humanoid robots were largely unaffordable for the mass market. ASIMO was not up for sale and renting it would cost as much as $150,000 a month. SoftBank’s 1.2-m (3 ft 11″) tall day-to-day companion Pepper costs at least $25,000 and its 58-cm (1 ft 10″) tall Nao is available for commercial purchase at around $8,000 per unit. When Zhou returned to Shenzhen, China’s southern city dubbed the world’s hardware haven, he decided to build his own humanoid robots geared for mass consumer adoption. His company, UBTECH (pronounced “you-bee tech”), would eventually grow into a robotic unicorn selling products to households around the world a few years later. With an aging population and rising labor costs, China is pressing full steam ahead in the race for manufacturing automation: the country is now the world’s biggest spender on industrial robots, buying 27% of the products on the market. There has been less investment, however, in service robots, which include household as well as entertainment and leisure products. “The development of the humanoid service robot industry is largely dependent upon technological advancement, the ability to recruit a pool of sufficiently deep talent and to lower manufacturing costs to be affordable by everyday people,” UBTECH’s Senior VP of R&D Paul Wu told TechNode. 40% of the company’s 800-900 employees work in R&D in China, Australia, and the US, and the company pours around 45% of its annual sales into R&D. Wu believes the market is about to take off. According to forecasts by International Federation of Robotics (IFR), there will be 42 million new service robots added for personal and domestic use between 2016 and 2019. Global turnover in domestic service robots is projected to be $22.4 billion during that period. It wasn’t until four years after Zhou started working on humanoid robots that he incorporated UBTECH. All those years prior were spent on developing a servo that was safe, stable, and cheap enough for the consumer market, says Wu. An integral part to humanoid robots, the servo is the connection between the moving parts, like a human’s joints, as well as motion control algorithms. UBTECH was eventually able to cut the cost of servos to a fraction of the market price. In 2014, its first humanoid robot Alpha 1S was born with a price tag of $499—still not cheap but potentially attractive to the more affluent families with a curiosity in new technology. With 16 servo joints, the adorable 40-cm (16-inch) tall Alpha 1S is nimble and can dance, tell stories, somersault, be an alarm clock, play football, and perform other actions programmed by the user via its visual editing software. By then Zhou has burned RMB 50 million ($7 million) of his own money. Cash strapped, he sold his cars and apartments that he acquired from early years’ of high-paying jobs. The big bet paid off. UBTECH’s total sales grew exponentially from RMB 2 million ($295,000) in 2014 to RMB 300 million ($44 million) in 2016, 60% of which came from overseas, and is projected to exceed RMB 1.5 billion ($220 million) in 2017. The revenue also comes from Jimu Robots, its line of STEM focused robots for 8-14 year-olds that can be found at Apple Stores. In 2016, 540 units of Alpha 1S were invited to perform synchronized dancing at China’s Spring Festival Gala, an annual TV spectacle with over 700 million viewers each year. That same year, UBTECH became a unicorn after their Series B of $1 million from CITIC Securities and CDH Investments. It is currently raising a Series C, with plans to go public. Although UBTECH believes humanoid robots may well help human beings run our lives one day, the technology is not yet ready. The current market size of small-size humanoid robots is very small—at around RMB 1 billion ($140 million), said Zhou in an interview this March. Meanwhile, various forms of smart home assistants have flooded and fragmented the market, from formless Google Home baked into simple speakers to robotic vacuum cleaners that come in unexciting shapes. 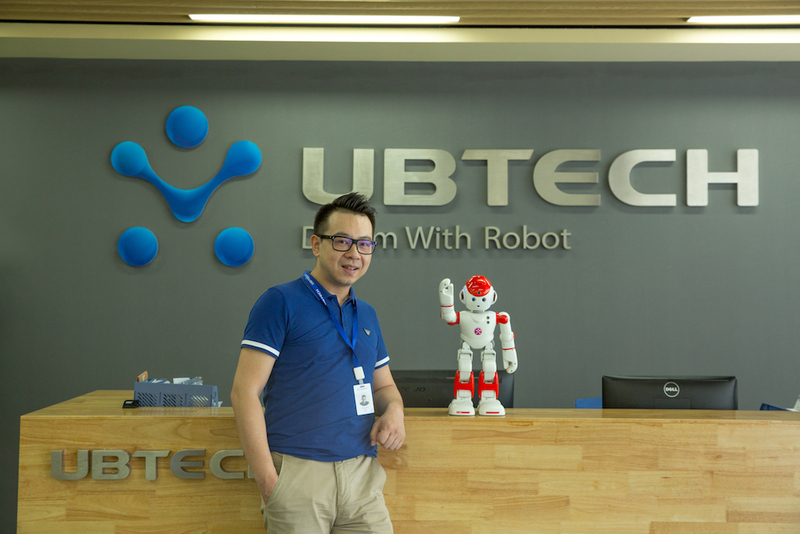 UBTECH envisions a more unified future dominated by humanoid robots. “We believe humanoids are the strongest vessel for AI. Products like smart speakers are just transitory,” reckons Wu. The company’s newest humanoid Alpha 2 has an open application platform for adaptation by third-party developers to teach robots new things. “At the end of the day, who wants to talk to a lifeless box?” asks Wu. Thus UBTECH has given a humanoid form called Lynx to Amazon’s Alexa with simplistic responses to Alexa queries. The rationale is that humans are more willing to interact with humanoid robots, which will, in turn, give UBTECH more user data for to improve its machine learning.